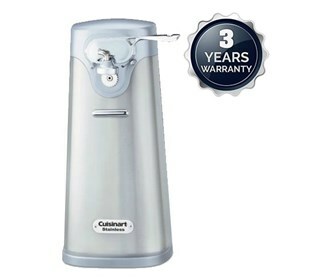 The Cuisinart SCO-60 deluxe stainless steel can opener is a product to be kept out on the counter. The unit's extra-wide base prevents sliding or tipping, while its press-and-release lever provides easy opening of any standard-size can. Once the blades pierce the can,cutting begins and do not require any manual assistance. The deluxe can opener stops cutting automatically once the can has been fully opened. The blade and handy magnetic lid holder are attached to the activation lever, which removes for convenient cleaning. The Deluxe Can Opener Stainless Steel has many exciting features for users of all types. 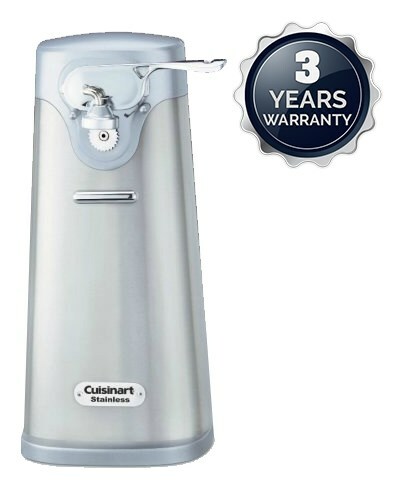 You can extend the lifetime of your Deluxe Can Opener Stainless Steel with the purchase of a FactoryOutletStore Factory Protection Plan. See the Deluxe Can Opener Stainless Steel gallery images above for more product views. The Deluxe Can Opener Stainless Steel is sold as a Brand New Unopened Item.